Next Friday, Sander and Daan will brawl against each other in a live developer match. We will play three games, with the total number of points determining the winner. Sander will be streaming the event from his perspective on his Twitch channel, talking about some of the strategies he uses as well as answering your questions from chat. The stream will start at 21:00 CET on Friday, so see you then! Another thing: we just updated our FAQ page on Kickstarter. We answered some frequently asked questions about ports to mobile and Switch, language support and the open-source release. Look for that here. Social stretch goals - new modes! Our announcement tweet has been retweeted enough times (54 at the time of writing) to unlock Correspondence Mode! In this asynchronous multiplayer mode, players can come online and submit their orders at any time. This allows you to be part of multiple matches at the same time, playing your turns whenever you see fit. With this mode also comes the functionality to save and load games, including versus AI games. The Battle Royale mode requires only 4 more people to share our announcement on Facebook. Get on that, peeps! 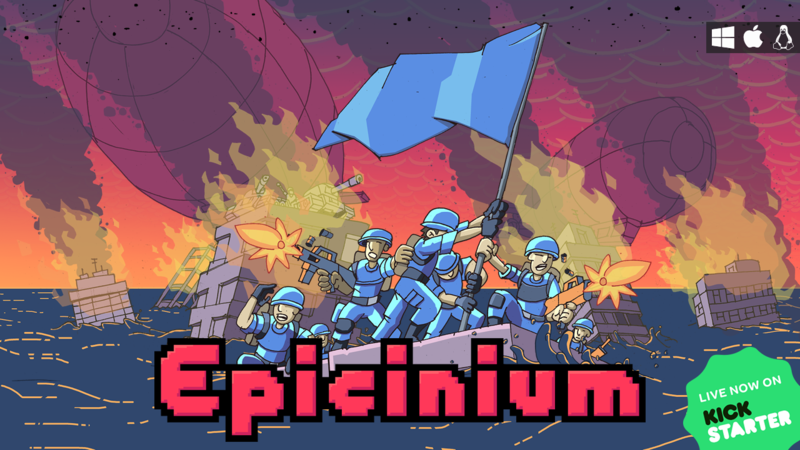 As promised in our last update, we will illustrate Epicinium's balanced environmental gameplay further by describing two (hypothetical) gamer profiles, both with equal ratings in the game. Let me introduce you to Cut-Throat Cloë and Considerate Caroline. Wastes no time and goes straight for the kill with a tank rush. Sometimes that's over quick, but other times it escalates into a full-blown cold war, at which point she likes to bring sappers into the mix for those extra explosions. This is all paid for by her massive amounts of industry that accelerate those nasty weather effects, but she's too busy winning to notice. Wears an eye patch that serves no purpose but to intimidate viewers of her live stream. If Cloë wants to improve her rating she'll need to win with more points, by directing her tanks through the desert and rubble instead of through those last remaining grass and forest tiles, and by concentrating her bombardments on the enemy cities instead of just wherever she sees a target. Also switching just a few of those industry tiles for less polluting towns would save a few points each game. Careful not to waste any precious points, she always seeks the most beautiful green spots to place her towns for income. She fights preferably with riflemen and the starting militia, but brings gunners into the fray when it becomes necessary. She often gets overwhelmed by early attacks before she's set up her towns. Usually pours herself a nice glass of water before a match, taking care to place it away from her computer in case she spills it. If Caroline wants to improve her rating with this strategy, she will need to play it that much smarter. She'll need to learn how to use the Focus ability to defend against early tanks, and how to sneak units into enemy territory unseen, to surprise her opponents with a sneak attack when they're fighting elsewhere. She can also consider changing up her set ways once in a while, to catch her opponents unaware with a strategy they would never expect from her. All right, have a great rest of your week, don't forget to back us on Kickstarter and we'll speak with you during the dev match on Friday, where you can see these strategies in action.